The slick and polished first pitch often scares people off. 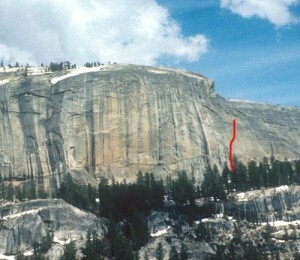 But the second pitch, an excellent sustained face with knobs and edges, is one of the best-protected face pitches in Tuolumne. Which SuperTopo guidebooks include a topo for Ciebolla? Joi Gallant on Pitch 2 of Pretty in Pink Point (5.12c).